This beautiful Fish Camp mountain home will accommodate your entire family in comfort. It has a full kitchen, dining area, large living room, and 3 bedrooms, as well as 2 bathrooms, one with a large tub. The home also offers a screened-in patio in which you enjoy the mountain forests all around you. 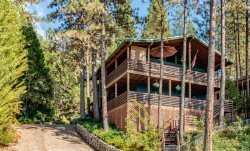 Ideally located, this wonderful mountain home is less than 2 miles from south entrance of Yosemite National Park, or about 30 miles from the Valley.